These are similar in nature to the user journey, but are more conceptual. That said they can be heavily informed by data and research. A conversion funnel shows the phases a user needs to pass through to make a purchase and it will be different for every product or industry. 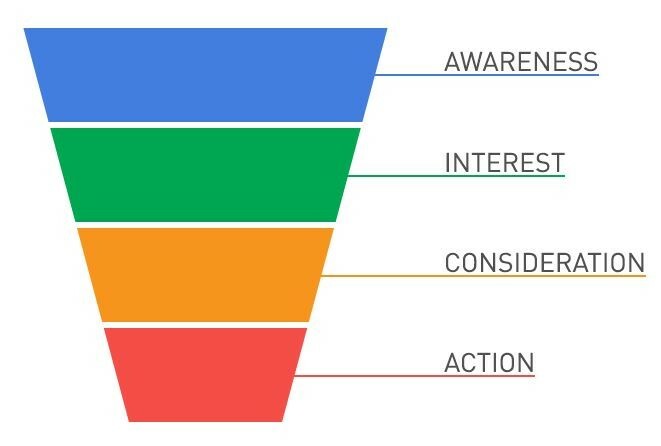 The image below shows the most basic conversion funnel. This illustrates the stages that a person typically passes through before making a purchase, with regards to your business. This is when the user first becomes aware of your brand. At this stage there may be no commercial intent at all. This is when the user starts to have some interest in making a purchase. This is when the user starts to consider where they are going to make the purchase. This is when the user acts and makes the purchase. If this is not on your site, then you have lost the business of this user. What stages are catered for on your site and how? What keywords are searched for in each stage? What are the entry points for most of our customers? What are the exit points for users? How to we cater for all stages? How do we move the user down the funnel? This is a brief summary and introduction to the conversion, often we include more steps and a cyclic component to repeat purchase in addition to the above stages.